Bring home the replica and symbols of Nativity Christmas Ornaments that not only decor your home but also make you feel highly closed to Christianity. We at HolyLand-Gifts.com understand what is the utility and value of an enchanting and accomplished Nativity Christmas Ornament for the firm believers of Christianity. Consequently, we offer wooden-made, innovative, hand-crafted and elegantly designed Nativity ornaments describing the presence of Mary, Joseph, three Wise Men, a Shepherd with Baby Jesus and a separate manger along with three animals that include a sheep, a cow, and a donkey. Find yourself more close to the king of the world—Jesus Christ with Nativity set as a tool for meditation and prayer. With our proud presence in the Catholic community, we are committed to represent impeccable and high quality Catholic religious supplies along with a superior customer service that makes us different from other websites dealing in the selling and supplies of religious items. 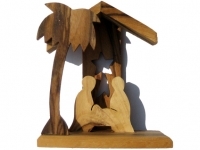 So browse our website to have a Wooden Nativity Set that speaks for itself. I am extremely happy with the service i received. Your customer service representatives are very professional, and i was delighted to receive such quick and easy help especially in regard to the specifications i requested. Thanks Dear.